An Invoice is a document that you give to your customer usually before you provide him the goods. The invoice can also be done at the same time of the delivery. The invoice includes the information the customer need to pay for the good. Also the list of the goods will be appearing on the invoice. A professionally designed free Excel invoice template that can be used as soon as downloaded. This invoice is, at the same time, simple and very useful. If you are a consultant, student doing tutoring, freelancer or a small company, this is the perfect tax invoice form for you. If you do not need an invoice but the pendant of it, you can find a purchase order template here and a receipt template is available from here. 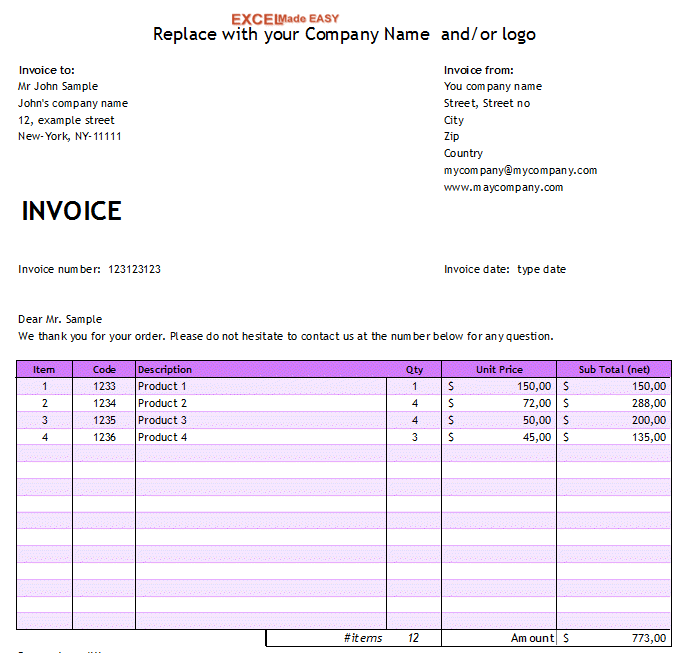 The main invoice template look like following but you can customize it as described here under. You have a Tax version and a no Tax version. In this invoice template you can change the themes very easily by going under Page Layout and selecting a theme. Look at the possible screenshot of this Excel invoice template. On the top left of the invoice, enter the name of your company, its address and other important mailing information. In the top of the invoice please insert the logo of your company or just remove this part from the invoice. In the middle right area of the invoice you can set the date. Then you can enter the invoice number which is important so that you can easily sort the invoices and then find the invoices. The bill to part of the invoice serve to add the name to which the invoice is billed or payed. The shipping is supposed to be at the same address as the bill address. The same invoice in a different style. And another style for this Excel invoice template. Using this free and simple tax invoice template, you can then modify this invoice at will. This invoice template is totally free to use. You can download this Excel Invoice template here. 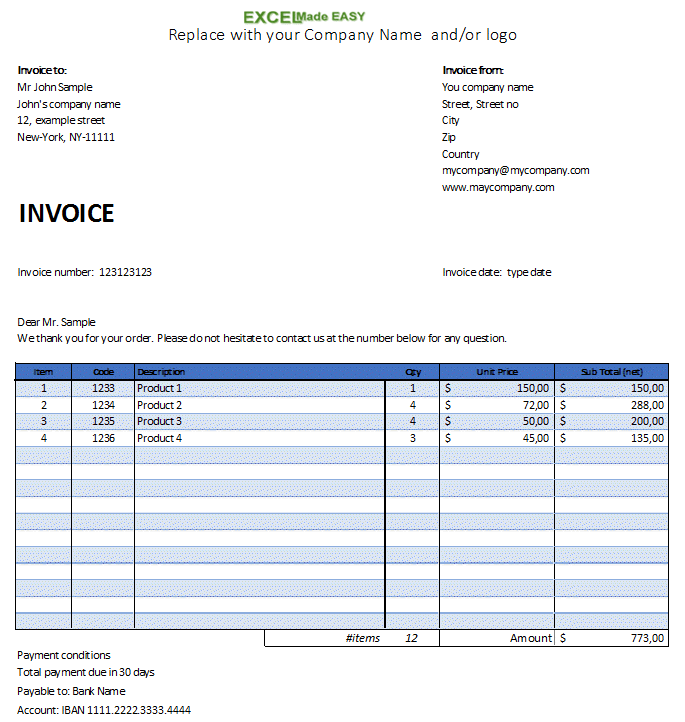 We hope that this free Excel invoice template will help you. Please look at our other templates in our 1000 examples page.